I don’t really get chicken wings. Like, I get that they are a vehicle for sauce and dip and that sauce and dip are two of humanity’s greatest triumphs, but as a vehicle they are clunky and difficult. There are too many parts of the chicken wing that are not meat, and you have to work for what you get, and you don’t get much. You have to keep eating chicken wings forever if you expect them to make a meaningful meal. And anyway, if I am going to get my hands dirty, it’s got to be for something really worthwhile, like crab legs or brownies. But Nick really likes them, and doesn’t even seem to care that they are messy and complicated. And since we always eat what I feel like eating sometimes it’s not a bad idea to throw him a bone. 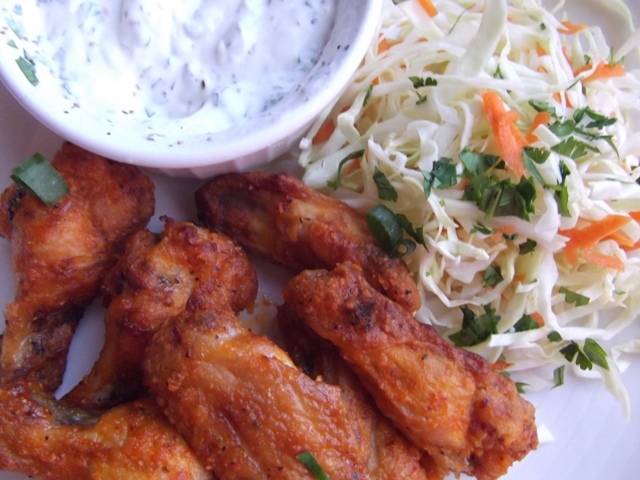 These wings are fried and then doused in sriracha and then baked, and I served them with a chilled dip of sour cream, lime juice, salt, pepper, and cilantro. For the longest time Nick ate in silence, not even pausing to swear at the Canucks or complain that he had to get his own beer. 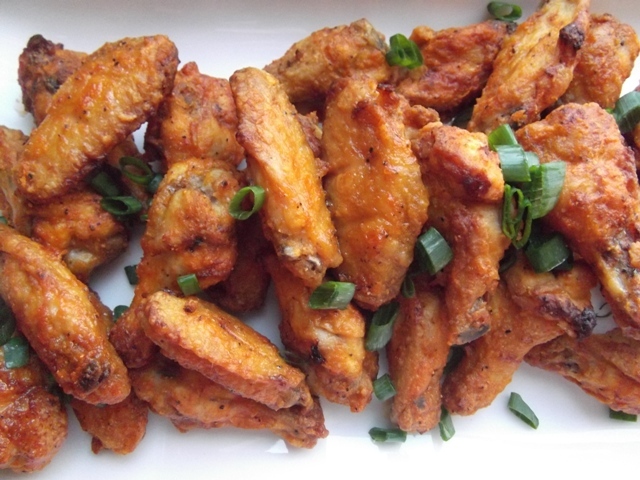 These are good wings – the first period has ended and he still hasn’t spoken a word. In a large pan over medium-high heat, heat oil for three minutes. Place chicken into a plastic bag with flour, and shake until wings are covered – you may need to do this in two batches. Place half the wings gently into the pan, and cook eight to 10 minutes, until golden. Remove to a plate lined with paper towels, and repeat with the second set of wings. 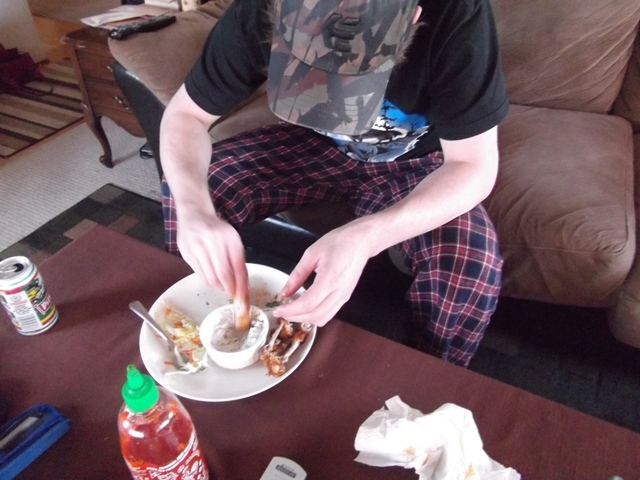 Meanwhile, in a large bowl, combine sriracha, butter, lime juice, salt, and pepper. 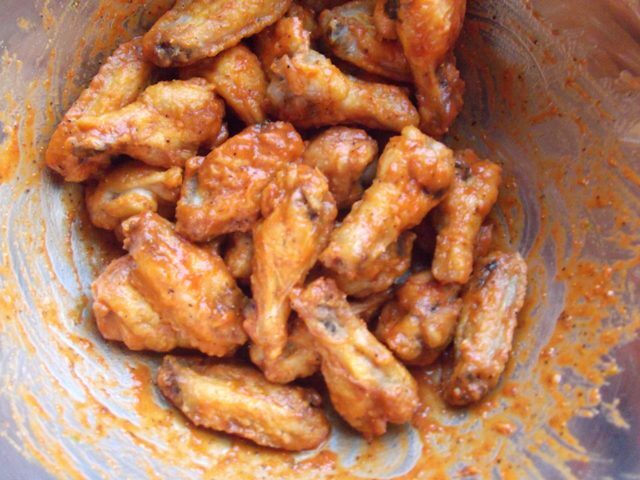 Add fried wings and toss to coat. Place on a baking sheet fitted with a wire rack. Bake for 25 minutes. Serve hot and sprinkled with chopped scallions. Next > Wordless Wednesday: This is why we can’t have nice things, Cat. Buffalo wings and chocolatey brownies for dessert would be a meal of heaven for me lol. My two favorite things. These are the only two foods I will get my hands dirty with so I enjoy it. Wonderful recipe and great post. I used to feel that way about wings until I had some really, really good wings. Then I realized that the mess was part of the fun and that it was worth it for good wings. Also, Alton Brown’s philosophy is that you’re bringing use to a part of the chicken that is almost completely useless. Babygirl: That does sound like a pretty good meal. Thanks! Crisi-tunity: I do like that chicken wings are made useful, but still … I think I might be alone on this one. Maybe I have just yet to try wings that really move me? These ones are close. Linda: Ha! Let me know if you end up making them. He made his own? Did he post a recipe? I got a sriracha cookbook for my birthday and though I haven’t made anything with it yet, a few of the recipes are begging for a little of the homemade stuff. I love wings a lot. The salty crunchy variety that soaks up all the honey garlic sauce I want. I am going to make these for Mr. and fry his face off, he’ll love it. Yes! Do it! Also it seems like maybe it’s time to give wings another chance? You had me at honey garlic sauce. This was a fabulous recipe! Finally got a chance to try it a couple of weeks ago and now I have a chance to also let you know. Passing it on. Keep up the great blog!